It’s two hours before game time, and I am standing with Jim Chones on the edge of The Q basketball court in Cleveland watching the end-of-the-bench players get in some shooting before the greats whose names you know come out. Chones is a radio broadcaster for the NBA champion Cleveland Cavaliers these days, and was a basketball great in his own right: First-team NCAA All-American at Marquette University in 1972, then 10 years playing in the ABA and NBA as a center/forward. Five years for the Cavs and a member of the Los Angeles Lakers championship team in 1980. We are talking old NCAA tournament basketball when Austin Carr walks by. Carr is a longtime TV analyst for the Cavs, and he is a man with a great basketball pedigree as well. 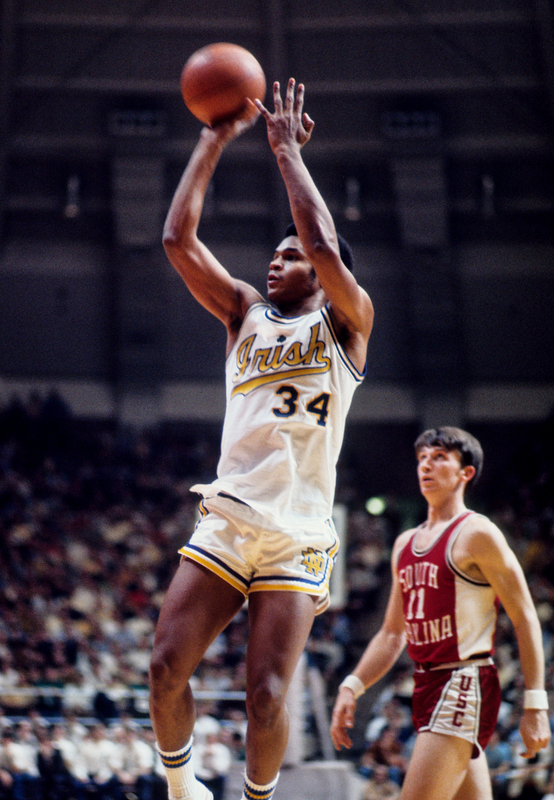 He was a first-team All-American while playing for University of Notre Dame in 1971, and the NBA’s top draft pick by the newly created expansion Cavs that year. The shooting guard had a good 11 years in the NBA, and even though he had five bad knee and foot injuries in his career, he averaged 15 points a game and scored more than 10,000 points in his NBA career. Chones is right about what Carr did almost 50 years ago, as he holds both game and all-time NCAA tournament scoring records for March Madness that are so far out there that they probably will never be broken. And as the NCAA men’s basketball tournament begins this week — and obsessive contemplation over bracketology and college affiliation stops millions of workers in America over the next three weeks — it’s odd that few of these crazed fans know who was the greatest scorer in tournament history. Part of the problem is that Carr didn’t play in the Atlantic Coast Conference, or the Big Ten or the Pac 12. Notre Dame was independent back then, and the school didn’t make it into the Final Four in his three years in the tournament. And Carr set his records at a time when the term “March Madness” didn’t even exist (outside of Illinois high school basketball) and most NCAA games weren’t nationally televised. First the numbers: Carr played for Notre Dame in the tournament from 1969-1971 in seven games. He averaged 41.3 points over those seven games, with Princeton University’s Bill Bradley second all-time with 33.7 points a game in nine games and Robertson of the University of Cincinnati third with 32.4 points in 10 games.. Broken down for individual tournaments, Carr has the two highest scoring averages in history: 52.7 points per game in the 1970 tourney, and 41.7 points per game in 1971. Look further, and Carr’s tourney records get even more impressive. He holds three of the top five scoring games in NCAA tournament – 61 (against Ohio University), 52 (University of Kentucky) and 52 (Texas Christian University). Carr also has five of the top 12 scoring games, and no other player appears more than once in that top 12 list, which includes Bradley, Robertson, David Robinson and Elvin Hayes. Carr is somewhat puzzled by his name being left out of the discussion these days of “best ever” for March Madness, but also acknowledges that time and how the game has changed influence memory. Notre Dame Fighting Irish guard Austin Carr (34) shoots a jump shot against the South Carolina Gamecocks at the Joyce Center. That same year, Carr scored 46 points to lead the Fighting Irish to an 89-82 win over No. 1-ranked UCLA, and he scored 15 of Notre Dame’s last 17 points. It was the most points ever scored by an individual against a John Wooden-coached team. “There is no one to compare with him man-to-man,” Wooden said of Carr’s performance. Carr still remembers those big games and those coaches. He grew up in Washington, D.C., and he and his parents agreed playing basketball was more about getting a college education than anything else. He chose Notre Dame because he came from a Catholic family and went to Mackin Catholic High School. After his junior year in college in 1970, there was some talk that he should leave school early for the American Basketball Association. 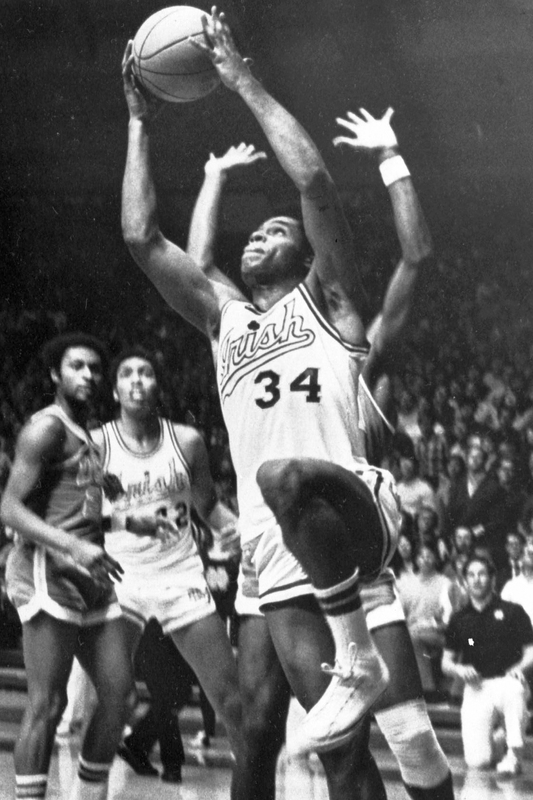 Notre Dame’s Austin Carr has eyes for the basket as he drives towards UCLA’s Steve Patterson, January 23, 1971. Carr’s 46-points led Notre Dame to an 89-82 victory. In the past five years, Sports Illustrated, ESPN and The Sporting News have published their list of the Top 75 NCAA tournament players. All-time tournament leading scorer Carr ranks No. 30, 27, and 31 in those rankings. Magic Johnson, Bill Russell, Abdul-Jabbar, Walton, and Christian Laettner are all ranked in the top 10 in all three, which are understandable. But Duke’s Bobby Hurley (No. 31, No. 16, No. 19), UCLA’s Gail Goodrich (No. 16, No. 18, No. 10), Indiana’s Isiah Thomas (No. 21, No. 22, No. 30), North Carolina’s Tyler Hansbrough (No. 25, No. 25, No. 13), and Syracuse’s Carmelo Anthony (No. 55, No. 23, No. 25) were all ranked ahead of Carr even though they scored less than half the points he did. Part of the reason the memory of Carr’s March Madness greatness has dimmed in some regard is that Abdul-Jabbar came right before him and Walton right afterward. The Indiana Hoosiers under Bob Knight went undefeated in 1976. The NCAA tournament was only 25 teams when Carr played in the early 1970s, and didn’t blow up in popularity and big TV ratings until Larry Bird and Magic Johnson played in their famed NCAA Final game in 1979. Len Elmore, an NCAA basketball analyst for ESPN and CBS, said that “those of us who played against him and so many other great players from that era know that those points Austin Carr scored back then were nothing short of amazing.” Elmore graduated from University of Maryland in 1974, and played for 10 years in the ABA and NBA until retiring from the New York Knicks in 1984. He also received a law degree from Harvard University and once served as an assistant district attorney in Brooklyn, New York. Carr understands how all this works and is not the least bit pissed by what many perceive as a history snub. “I’ve never been one to get enamored with self-promotion,” he said. “But with how the NCAA tournament is run and promoted now, it is easy to see that there are too many people with too many different agendas involved,” Carr concluded. “They get confused with thinking that somehow everything is part of a promotion, and something that happened a long time ago can’t get more people to watch games or to sell more products so there is no reason to mention it. Daniel McGraw is a freelance writer in Lakewood Ohio and is a contributor to Politico, Pacific Standard, The Guardian, Next City and others.